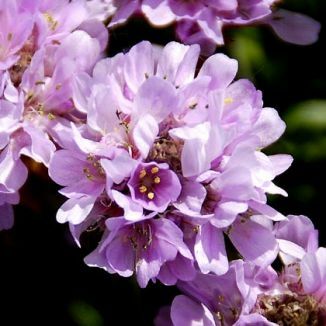 Thrift is not easily confused with other wild plants on this web site. Also known as Sea Pink, this cushion-forming perennial carpets cliffs, coastal roadsides and saltmarshes from April to July with dense tufts of papery, pink flowers and grass-like grey-green leaves. The little individual flowers are borne in dense, roundish heads 15-25mm across, on slender, leafless stalks. Below the flower heads, the calyx extends in a papery, scaly sheath. The leaves are grass-like, basal and deep green. 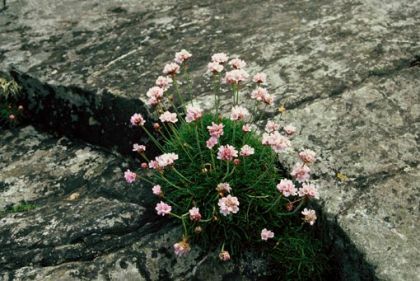 Thrift is also found in some mountain locations. This is a native plant and belongs to the family Plumbaginaceae. I first found this flower in Derrynane, Co Kerry in the early 1950's and photographed it on Black Head, Co Clare in 2004. This flower appeared on the old English twelve-sided threepenny-bit which was introduced in 1937 – perhaps it was meant to encourage another kind of 'thrift'?